As you probably know, Scala 2.11 was released last month! All crew to the upgrade stations! It’s a pity, that @ScalaIDE does not support #Scala 2.10 and 2.11 project at the same time. Indeed, Scala 2.10 and 2.11 are not binary-compatible, and since the Scala IDE runs a version of the compilerbased on either 2.10 or 2.11 (depending on which Scala IDE flavor you download), it couldn’t deal with projects based on mixed major versions of Scala. Now, don’t get me wrong: if you have the opportunity of upgrading to Scala 2.11, you most definitely should: the new compiler is faster, has a lot of new features, and the lack of language-level changes allow for a quick and painless upgrade. But if you’re dependent on projects that haven’t upgraded yet, or more generally if you work on a legacy code base, you couldn’t use projects working on two different major versions of Scala in the same workspace on Scala IDE. An experimental flag has been introduced in the Scala 2.11 compiler. Adding -Xsource:2.10 makes the type checker run in “legacy” mode. It will not report errors in some situations where the 2.11 compiler would (the 2.11 type checker being usually a bit stricter). Beware, however: this setting is for now considered fragile and extremely sensitive (as with all ambitious things related to the typechecker). Please report any and all issues of the type checker doing weird things on your favorite 2.10 project. But this allows us, on a per-project basis, to make the Scala IDE deal with projects in 2.10 mode ! 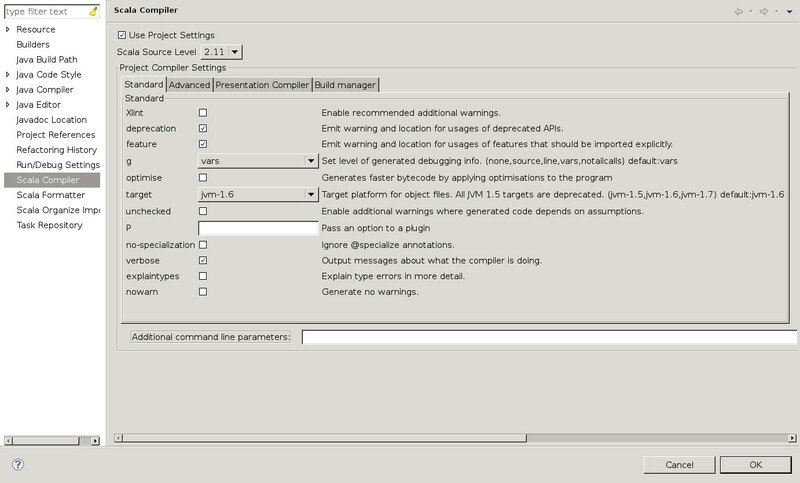 You can now add -Xsource:2.10 to the compiler options of your project, and have the Scala IDE report errors, completions, semantic highlighting just as it would if it was based on Scala 2.10. Moreover, since we are now bundling another set of jars for Scala 2.10 in the Scala IDE plugin (and doing a little bit of wiring), we’ll have the IDE build your projects using an authentic Scala 2.10 compiler. Configuration for the Scala IDE is still business as usual: the projects you import in your workspace are still assumed to run with the bundled version of Scala (2.11), and you will need to make a few changes to make the editor understand your project has a 2.10 source and build. First, go to the preference page of your project, and click “Use project-specific settings” to turn on project-specific configuration (you’ll have to repeat those steps for every project for which you want to use the compatibility mode). Second, click on the source-level option, setting the source for this project to 2.10. 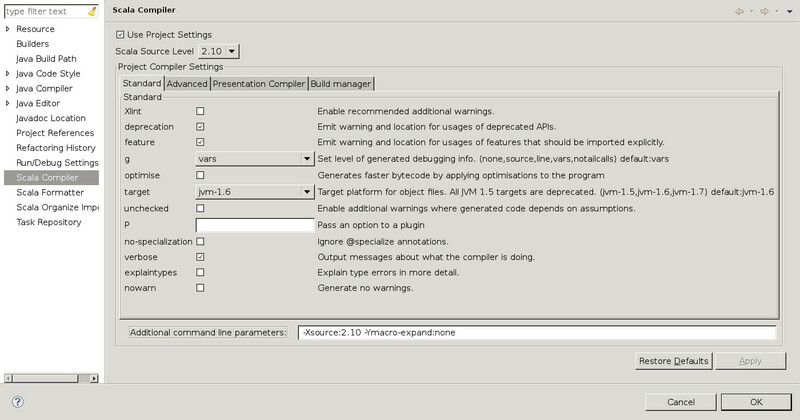 This will automatically add -Xsource:2.10 -Ymacro-expand:none to your compiler settings. After you close the project, any errors about the classpath in the problems view should disappear. If you reopen properties, you’ll see the -Xsource and -Ymacro-expand options have been added to compiler options. Clicking ‘Yes’ on this dialog has the same effect as setting the source Level to 2.10 above. sbteclipse creates an eclipse configuration from your sbt-based project. In that process, it usually rewrites the required classpath of your project, to replace the scala-compiler and scala-library with a generic, version-less compiler (resp. library) bundle that will automatically match the IDE’s bundled version. In the case of a 2.10 project, you don’t want that. You want the classpath to unambiguously require a 2.10 scala compiler or library version, which matches the one in your sbt configuration. To do that, sbteclipse introduces since version 2.5.0 an option with-bundled-scala-containers (default value: true) which lets you specify that you want to keep scala-compiler and scala-library versioning information in creating an Eclipse configuration. You should then get a Scala project that will ask for the exact same version of the compiler as the one it’s configured to run with in sbt. First, the compatibility mode introduced by the -Xsource flag can only be used on a per-project basis. If you want a workspace-wide 2.10 IDE, you should turn to the 2.10 flavors of the Scala IDE download. Since whitebox macros have some incompatible improvements between 2.11 and 2.10, the IDE is not able to expand macros for you in compatibility mode. This probably will remain a long-term limitation of this mode. This is why the -Ymacro-expand:none setting works conjointly with the -Xsource:2.10 setting. Finally, in case your classpath is not valid, the dialog described above will appear. However, some classpath checks are triggered by events sent from the eclipse platform we have little control over, so that in some cases, you may see this dialogue pop up twice, one after the other. The second occurence should not affect any settings. We are very eager for detailed, reproducible bug reports that would let us know precisely about when this happens.